Cl The Dutch-Flemish Day of Philosophy (DFDOP) is a conference series that aims to bring together philosophers from all philosophical disciplines for a day of sharing of philosophical ideas. The DFDOP is a long-standing tradition and a great event to meet other philosophers working in the Netherlands or Belgium. The 37th Dutch-Flemish Day of Philosophy took place on September 16 2017 at the Vrije Universiteit Amsterdam, The Netherlands. It was organised by the PhD Council of the Dutch Research School of Philosophy (OZSW) and the Vrije Universiteit Amsterdam. Presentations at the DFDOP can be in Dutch or English. The winners of the Best Presentation Award at the 37th Dutch-Flemish Day of Philosophy were Maria del Rosario Martinez-Ordaz (Jury Award) and Lotte Spreeuwenberg (Public Award). Congratulations to both of you! Many thanks to all speakers, the jury (Herman Philipse, Daan Roovers, and Katrien Schaubroek), and the participants for making the DFDOP37 another successfull event. Click here to see some pictures from the conference. 11/08/17: 12 excellent abstracts have been selected. Register now! 12/07/17: All abstracts are in, the program committee is currently reviewing them. 29/05/17: Herman Philipse, Daan Roovers, and Katrien Schaubroeck accepted our invitation to be part of the jury at the Dutch-Flemish Day of Philosophy. 17/05/17: Poster ready. Download here if you'd like to announce the DFDOP at your department. 08/05/17: Call for Abstracts announced. The conference format with an emphasis on concise, compelling presentations premiered succesfully at the 2016 Dutch-Flemish Day of Philosophy. More than 60 participants enjoyed instructive, enterntaining and lucid presentations of novel philosophical ideas. Due to last years success, we continue the 'philosophy slam' presentation format in 2017. We expect presentations on the full range of philosophical topics ranging from the history of philosophy, via epistemology and metaphysics, over logic and to value theory. Speakers are heartily encouraged to try out something new – in regards to both the mode as well as the content of their presentations. A jury will present an award for the best talk at the 37th DFDOP. Find out more about the 'philosophy slam' on our practical information webpage. Speakers have 10 minutes to present. 5 additional minutes are reserved for questions and answers. All presentations will be plenary talks with all participants present, and there won’t be parallel sessions. The model for this format is the so-called ‘Science Slams’, an increasingly popular event of science communication. Authors are free to choose your mode of presentation as you see fit, there are no specific presets. More on this here. To give a presentation, submit your abstract (200-300 words, in Dutch or English) by July 12 2017. Abstracts will be subject to double-blind review. Successfull authors will be informed by July 24 2017. 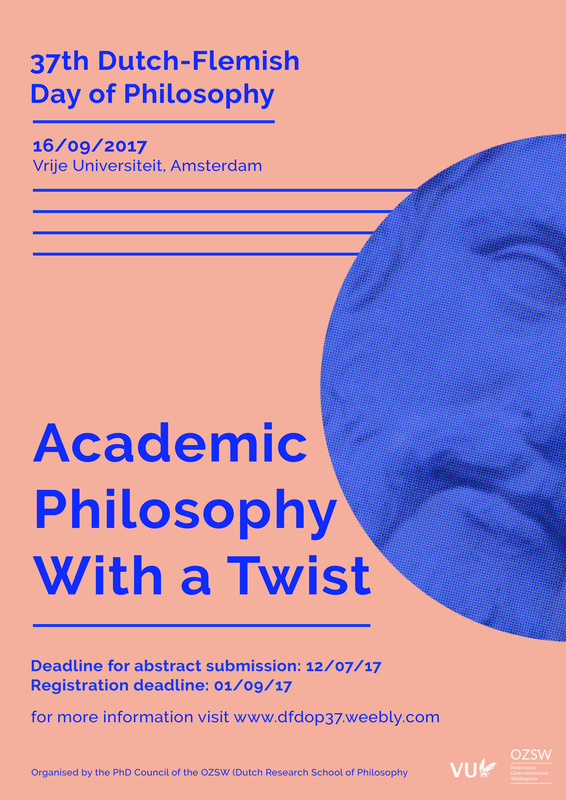 Hosted by the Vrije Universiteit Amsterdam, supported by the Dutch Research School of Philosophy (OZSW), organised by the OZSW Ph.D. Council.